SYDNEY, Australia -- Like the Chinese art form of Feng Shui will protect you from negative energy, the shark repellent sticker aptly named Fang Shooey is said to protect you from the jaws of any shark. The fatal shark attack of a 21-year-old woman at Stradbroke Island in Queensland has reignited discussion about the risk swimmers and surfers take when they enter the water. CSIRO Research Scientist Richard Pillans recently told us about the Behaviour of Bull Sharks which are being held responsible for the attack. Over the past decade there has been an increase in the research and development of devices that deter sharks. 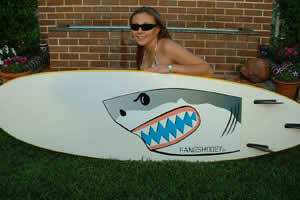 Some of the shark deterrents available in the market include electronic shields and chemical repellents. But now two Sydney-based men have developed what they believe could be a potentially life-saving addition for surfboard riders. Danny Togo and Craig Wills are the designers of Fang Shooey, a sticker and picture of a Great White shark, which they believe, stuck to the bottom of surfboards will deter sharks from attacking. It may seem like a simple concept but both men are avid surfers and Craig who has a history in Marine Biology says the idea stuck when they were watching a documentary on Great White Sharks. "A leading shark researcher, Mark Marks was swimming with white pointers outside the cage with a device called a gape board. That's a big caricature of a white pointer and we just thought, jeez lets take this one step further and add the correct colours and exaggerate the size of the eye and the teeth and put it on the bottom of surfboards," says Craig. "The sticker doesn't affect the performance of surfboards", Craig says, "It's a super tack 1-metre sticker - we took it down to South Australia, 40 km off Port Lincoln where there were 10 to 15 white pointers under the boat and we threw six or seven boards out and were amazed at the results". Craig says the skipper of the boat, a leading researcher, was convinced the boards wouldn't 'last 20seconds' and that 'they'd be smashed to smithereens'. "But they were out there for that long that it was actually upsetting them, so they had to pour about an inch thick of tuna oil and burley and chum blood over the board before it actually got a result and the shark bumped the board". Which could lead to the summation that if you don't pour burley over your board you've got a good chance of survival using the sticker? "Yeah, that's right! Well, listen if you're out there on your own and it's dusk or dawn or there's a shark out there - what we're thinking is that at least you've got some kind of protection with Fang Shooey," says Craig. "When a shark swims underneath they can easily identify the sticker as another shark", Craig says, "The right colours have been used including grey for the body and dull pink for the gums". But it is important to note that in the recent shark attack on Stradbroke Island, the bull shark has been identified as the likely culprit, and it's known to prefer murky waters and also detects its prey by vibration not sight. "Yes, that shark is a huge problem all around the world. In Africa they call the bull shark a Zambezi shark. In India they call it a Ghangi shark. In America they've got problems with them also - they'll actually attack in 2 feet of water. They call them the pit-bull of sharks; they're an absolute nuisance shark. "At the end of the day the bull shark looks at what it's attacking - we know one thing and that's that the great white doesn't have any other predators. It's the top of the food chain as far animals go in the sea. We still think if you've got it on your board you still might have a chance," says Craig. sounds and looks like a good idea to me. if the story about the boards not being attacked by the whites during the experiment is true, then put them on all boards as a standard, by law. I swam with a shark which was about six feet long on an open water dive without any protection at all. It swam to about eight feet from my instructor and i. It was not afraid at all, it was also not aggressive. i think it was coming for a look at the two of us and nothing more. It could have been having a" BAD DAY" of course, and that could have made it a whole different experience. Maybe it had already had breakfast. One problem with this experiment... Where was the control surfboards? i.e the surfboards without the stickers to see if the sharks would indeed attack the surfboards without the Fang Shooey when placed among the stickered surfboards? Question: 1. Murky water 2. a shark will still attack if it is bigger then you? (we see bigger sharks attacking smaller ones) 3. How about more aggressive sharks? Tigers, Hammerheads, Bull. can we get tests on them too? 4. Need to do a comparison test a few boards with stickers and a few boards without to see what the sharks go for. May also help to place dummy's on the tops of the boards to make them look more like actual surfers with the arms in the water.